Fairway Casino bonus offers are numerous, but you have to send an email or code before you can collect them. Even so, they are very worth the effort. There is the $5 exclusive no deposit bonus, using code 5FREE. Simply open up live chat or email support@fairwaycasino.com asking about the code. You must mention code 5FREE to take advantage. Wagering requirements are 35x. You can get up to €100 free as a 100% deposit match, just for being a new customer. After this, there are plenty of other opportunities to claim promos, coupons, vouchers, and free spins, by referring a friend, checking for daily bonus offers, and entering into special tournaments. It is important to check the rules and special instruction for each bonus, so that you don't miss crucial information and steps necessary to claim your money. There are no mobile gaming options or apps for iPhone, iPad, or Android devices. This casino is more focused on the live gaming options they offer, as well some virtual gaming options. As mobile options become more popular and catch on in other casinos, perhaps they will lean toward adding apps and downloadable play. 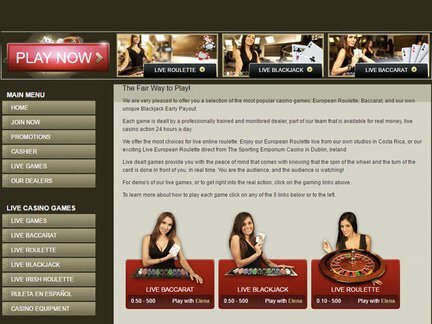 ExclusiveBet Casino is a good comparison for Fairway Casino, as they both offer similar options for gaming and bonuses. While you have to work a little harder to get the bonuses at Fairway, they tend to yield more money than those at ExclusiveBet. In most aspects, this casino is tough to beat. This casino is most popular in the UK and in France. USA players are not accepted here, and it is generally preferred by European players more than any others. They allow Australian Dollars, Canadian Dollars, Euros, UK Pounds, and US Dollars as currency to play, and offer Dutch, English, French, Greek, Italian, Russian, Spanish, and Swedish languages for play and support. The most popular playing option at Fairway Casino is the live gaming that they offer, where you can interact with a real dealer in a live game. They also offer 3D slots, card and table games, slots, video poker, and roulette. Some of the most popular of these they offer are Jack's T-rex, Rat-A-Keno, Golden Casino, and Fortune of the Pharos. Many of these are slots games, where you can earn free spins and extend your play time. Many of the big winners here come from live games, and you can join up to check out the stats and totals. There are a few progressive jackpot games here, with total climbing over $80,000. It all depends on the style of game you prefer, and when you log on. Customers often complain about the more limited options of virtual gaming here, but the fact is this casino is more focused on the live gaming they have to offer. There is also some frustration about the lack of live chat support, but they do have phone and email response with a reputation for fast answers. Most of the complaints stem from not receiving bonuses, due to the sometimes difficult process you have to go through to get them. Support is happy to resolve these issues as quickly as possible, to promote customer satisfaction. Fairway Casino Affiliates owns Fairway Casino, and it is affiliated with Live Casino partners to allow the offering of live play. They are licensed in Costa Rica, and have been online since 2010. They have always been a casino focused on instant play and live gaming, and to date have not offered mobile apps. They are a very safe gaming company which offers top quality protection of your information, both personal and financial. My experience with Fairway casino bonuses, including their $5 no deposit option, was good though I did sometimes get frustrated with all of the emailing I had to do to obtain them. It wasn't a difficult sign up process, and there was nothing to download because it is strictly instant play. I would very much like to see this casino come up with some mobile apps for iPhone, iPad, or Android devices, though I don't want to have more emailing requirements for any resulting coupons, vouchers, promos, or bonuses. I would recommend this casino to my friends, especially those curious about live gaming, or anyone who wants to try it out. This casino gets a 4 rating from me. Though the bonuses could sometimes take a few steps to earn, they added up to a respectable sum, and greatly enhanced my play experience. I also had a great time trying live gaming.